The live auction at the FRHS Fur Ball began with a game that auctioneer Doug Sorrel led. Guests had the opportunity to purchase bead necklaces. The proceeds from this purchase went toward the fundraiser. The game involved those with the necklaces to stand and guess “heads” or “tails.” Sorrel would then flip a coin. Those who guessed wrong would lose a strand. The last person with a strand of beads won the game and the prize. On Saturday, March 23, the Fayette Regional Humane Society (FRHS) hosted the first-ever Fur Ball, which sold out at 280 tickets. The ball was a formal event where guests could dress in formal or festive wear. There was a cash bar, dinner, raffles, a silent auction and a live auction. The band “Dumbfounded” played live for the event. Dinner was provided by Jacob Plahuta. Plahuta is a chef at a restaurant on the Nashville strip called “M Street- Moto.” Guests received a plate of food and had desserts at their tables. The event had several speakers, including Dr. Lee Schrader, the executive director of FRHS. One of the videos they shared for the guests was “Ethan’s Story.” Ethan joined the guests for a short time after the video was shared to allow them to see positive outcomes the FRHS is working toward. The live auction was orchestrated by auctioneer Doug Sorrel. Several items and vacations were auctioned off. Many vacation packages were auctioned off, not once but twice. Brie Buyaky was in charge of the silent auctions. According to Buyaky, they had 31 items in the silent auction alone. Numerous items were available for raffle, and winners of the raffles were announced at the end of the night. Centerpieces on the dinner tables were available to purchase at the conclusion of the event. Centerpieces had been provided by local business, Back-En-Thyme Flower and Gift Shop. Adams said the FRHS receives support from many sources both inside and outside Fayette County. According to him, guests came from all over, including Kentucky, for the event. The money they raised through the event will help with various programs. These programs include the low-cost spay and neuter program, the trap, neuter and release program, the humane agents’ investigations of animal cruelty, adoptions, medical care for animals and vaccines for animals. One of the things they auctioned off was the right to name the number one dog suite that will be a part of this new structure. The right to name the suite was auctioned off for $5,750. 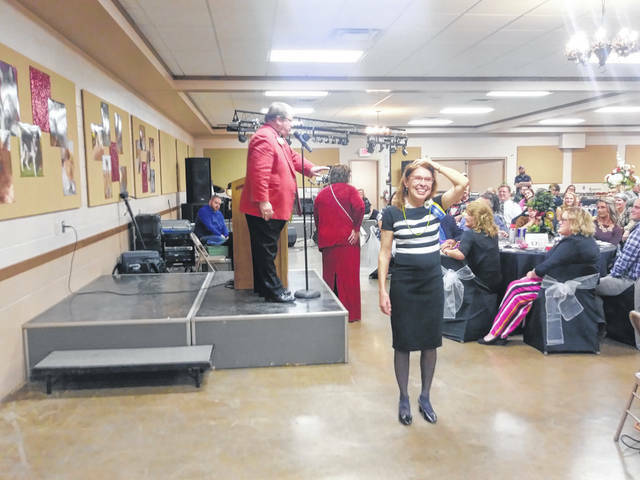 https://www.recordherald.com/wp-content/uploads/sites/27/2019/03/web1_20190323_195953.jpgThe live auction at the FRHS Fur Ball began with a game that auctioneer Doug Sorrel led. Guests had the opportunity to purchase bead necklaces. The proceeds from this purchase went toward the fundraiser. The game involved those with the necklaces to stand and guess “heads” or “tails.” Sorrel would then flip a coin. Those who guessed wrong would lose a strand. The last person with a strand of beads won the game and the prize.